The architects of the Oslo peace accords understood Jerusalem's power. Fearing that even discussing the holy city's future would detonate the fragile truce between Israelis and Palestinians, they tried to defer the issue until everything else had been settled. But it is now all too clear that this approach has failed. Last September, riots met the opening of a new entrance to the ancient Hasmonean tunnel, while the recent building of apartments on an empty plot in eastern Jerusalem has brought the Netanyahu-Arafat dialogue to a bitter and bloody stand-still. And so the international actors must begin to do what they had hoped to postpone: sort through the Jews' and Muslims' conflicting claims on the city that King David entered three millennia ago. The debate matters. In Jerusalem, the theological and historical arguments matter, serving often as the functional equivalent of legal claims. The strength of these arguments will ultimately help determine who governs the city. Already we hear the ritual and relativistic cliche that Jerusalem is "a city holy to both peoples." But like most cliches, this one is more false than true. Jerusalem stands as the paramount religious city of Judaism, a place so holy that not just its soil but even its air is deemed sacred. Jews pray in its direction, invoke its name at the end of each meal and close the Passover service with the wistful statement "Next year in Jerusalem." In contrast, Jerusalem is not the place to which Muslims pray. It is not directly connected to any events in Muhammad's life. And it is not even mentioned by name in the Koran. The city never became a cultural center or served as capital of a sovereign Muslim state. Jerusalem has mattered to Muslims only intermittently over the past thirteen centuries, and when it has mattered, as it does today, it has been because of politics. The story begins in a.d. 622, when the Prophet Muhammad fled his hometown of Mecca for Medina, a city with a substantial Jewish population. He adopted a number of practices friendly to Jews: a Yom Kippur-like fast, a synagogue-like house of prayer, and kosher-style dietary laws. Muhammad also adopted the Judaic practice of facing the Temple Mount in Jerusalem during prayer; "He chose the Holy House in Jerusalem in order that the People of the Book [i.e., Jews] would be conciliated," notes At-Tabari, an early Muslim commentator on the Koran, "and the Jews were glad." Modern historians agree: W. Montgomery Watt, a leading biographer of Muhammad, interprets the prophet's "far-reaching concessions to Jewish feeling" as part of his "desire for a reconciliation with the Jews." But Jews criticized the new faith and rejected Muhammad's gestures, leading Muhammad to eventually break with them, probably in early 624. The most dramatic sign of this change came in a Koranic passage (2:142-52) ordering the faithful no longer to pray toward Syria but toward Mecca instead. (The Koran and other sources only mention the direction as "Syria"; other information makes it clear that "Syria" means Jerusalem.) This episode initiated a pattern that would be repeated many times over the succeeding centuries: Muslims have taken serious religious interest in Jerusalem at times when it has most conspicuously served them politically; and when the political climate has changed, the religious interest has flagged. In the century after Muhammad's death, politics prompted the Damascus-based Umayyad dynasty, which controlled Jerusalem, to make this city sacred in Islam. Embroiled in fierce competition with a dissident leader in Mecca, the Umayyad rulers were seeking to diminish Arabia at Jerusalem's expense. They sponsored a genre of literature praising the "virtues of Jerusalem" and circulated accounts of the prophet's sayings or doings (called hadiths) favorable to Jerusalem. In 688-91, they built Islam's first grand structure, the Dome of the Rock, on top of the remains of the Jewish Temple. They even reinterpreted the Koran to make room for Jerusalem. The Koran, describing Muhammad's Night Journey (isra'), reads: "[God] takes His servant [i.e., Muhammad] by night from the Sacred Mosque to the furthest mosque." When this Koranic passage was first revealed, in about 621, a place called the Sacred Mosque already existed in Mecca. In contrast, the "furthest mosque" was a turn of phrase, not a place. Some early Muslims understood it as metaphorical or as a place in heaven. And if the "furthest mosque" did exist on earth, Palestine would have seemed an unlikely location, for that region elsewhere in the Koran (30:1) was called "the closest land" (adna al-ard). But in 715, the Umayyads built a mosque in Jerusalem, again right on the Temple Mount, and called it the Furthest Mosque (al-Masjid al-Aqsa, or al-Aqsa Mosque). With this, the Umayyads not only post hoc inserted Jerusalem into the Koran but retroactively gave it a prominent role in Muhammad's life. For if the "furthest mosque" is in Jerusalem, then Muhammad's Night Journey and his subsequent ascension to heaven (mi'raj) also took place on the Temple Mount. But Jerusalem still mattered theologically only when it mattered politically, and when the Umayyad dynasty collapsed in 750, Jerusalem fell into near-obscurity. For the next three and a half centuries, books praising the city lost favor and the construction of glorious buildings not only stopped, but existing ones fell apart (the Dome over the rock collapsed in 1016). "Learned men are few, and the Christians numerous," bemoaned a tenth-century Muslim native of Jerusalem. The rulers of the new dynasty bled Jerusalem and the surrounding country through what F. E. Peters of New York University calls "their rapacity and their careless indifference." By the early tenth century, notes Peters, Muslim rule over Jerusalem had an "almost casual" quality with "no particular political significance." In fact, even the Crusade conquest of the city in 1099 initially aroused only a mild Muslim response: "one does not detect either shock or a sense of religious loss and humiliation," notes Emmanuel Sivan of the Hebrew University, a scholar of this era. Only as the military effort to retake Jerusalem grew serious in about 1150 did Muslim leaders stress Jerusalem's importance to Islam. Once again, hadiths about Jerusalem's sanctity and books about the "virtues of Jerusalem" appeared. One hadith put words into the Prophet Muhammad's mouth saying that, after his own death, Jerusalem's falling to the infidels is the second greatest catastrophe facing Islam. Once safely back in Muslim hands after Saladin's reconquest, however, interest in Jerusalem dropped, to the point where one of Saladin's grandsons temporarily ceded the city in 1229 to Emperor Friedrich II in return for the German's promise of military aid against his brother. But learning that Jerusalem was back in Christian hands again provoked intense Muslim emotions. As a result, in 1244, Muslims retook the city. The psychology at work bears note: that Christian knights traveled from distant lands to make Jerusalem their capital made the city more valuable in Muslim eyes. Sivan writes, "It was a city strongly coveted by the enemies of the faith, and thus became, in a sort of mirror-image syndrome, dear to Muslim hearts." The city then lapsed into its usual obscurity for nearly eight centuries. The Temple Mount sanctuaries were abandoned and became dilapidated. Under Ottoman rule (1516-1917), Jerusalem suffered the indignity of being treated as a tax farm for non-resident, one-year (and therefore very rapacious) officials. The Turkish authorities raised funds by gouging European visitors, and so made little effort to promote Jerusalem's economy. The tax rolls show soap as the city's only export. In 1611, George Sandys found that "Much lies waste; the old buildings (except a few) all ruined, the new contemptible." Gustav Flaubert of Madame Bovary fame visited in 1850 and found "ruins everywhere." Mark Twain in 1867 wrote that Jerusalem "has lost all its ancient grandeur, and [has] become a pauper village." In modern times, notes the Israeli scholar Hava Lazarus-Yafeh, Jerusalem "became the focus of religious and political Arab activity only at the beginning of the present century, and only because of the renewed Jewish activity in the city and Judaism's claims on the Western Wailing Wall." British rule over the city, lasting from 1917 to 1948, also galvanized Muslim passion for Jerusalem. The Palestinian leader (and mufti of Jerusalem) Hajj Amin al-Husayni made the Temple Mount central to his anti-Zionist efforts, raising funds throughout the Arab world for the restoration of the Dome of the Rock. Arab politicians made Jerusalem a prominent destination; Iraqi leaders frequently turned up, where they demonstrably prayed at Al-Aqsa and gave rousing speeches. But when Muslims retook the Old City with its Islamic sanctuaries in 1948, they quickly lost interest in it. An initial excitement stirred when the Jordanian forces took the walled city in 1948--as evidenced by the Coptic bishop's crowning King 'Abdallah as "King of Jerusalem" in November of that year--but then the usual ennui set in. The Hashemites had little affection for Jerusalem, where some of their most devoted enemies lived and where 'Abdallah himself was shot dead in 1951. In fact, the Hashemites made a concerted effort to diminish the holy city's importance in favor of their capital, Amman. Jerusalem had served as the British administrative capital, but now all government offices there (save tourism) were shut down. The Jordanians also closed some local institutions (e.g., the Arab Higher Committee) and moved others to Amman (the treasury of the Palestinian waqf, or religious endowment). Their effort succeeded. Once again, Arab Jerusalem became an isolated provincial town, now even less important than Nablus. The economy stagnated and many thousands left Arab Jerusalem. While the population of Amman increased five-fold in the period 1948-67, Jerusalem's grew just 50 percent. Amman was chosen as the site of the country's first university as well as of the royal family's many residences. Perhaps most insulting of all, Jordanian radio broadcast the Friday prayers not from al-Aqsa Mosque but from a mosque in Amman. Nor was Jordan alone in ignoring Jerusalem; the city virtually disappeared from the Arab diplomatic map. No foreign Arab leader came to Jerusalem between 1948 and 1967, and even King Hussein visited only rarely. King Faisal of Saudi Arabia often spoke after 1967 of yearning to pray in Jerusalem, yet he appears never to have bothered to pray there when he had the chance. Perhaps most remarkable is that the Palestinian Liberation Organization's founding document, the Palestinian National Covenant of 1964, does not even once mention Jerusalem. All this abruptly changed after June 1967, when the Old City came under Israeli control. As in the British period, Palestinians again made Jerusalem the centerpiece of their political program. Pictures of the Dome of the Rock turned up everywhere, from Yasir Arafat's office to the corner grocery. The PLO's 1968 Constitution described Jerusalem as "the seat of the Palestine Liberation Organization." Nor were Palestinians alone in their renewed interest. "As during the era of the Crusaders," Lazarus-Yafeh points out, many Muslim leaders "began again to emphasize the sanctity of Jerusalem in Islamic tradition," even dusting off old hadiths to back up their claims. Jerusalem became a mainstay of Arab League and United Nations resolutions. The formerly stingy Jordanian and Saudi governments now gave munificently to the Jerusalem waqf. As it was under the British mandate, Jerusalem has since 1967 again become the primary vehicle for mobilizing international Muslim opinion. A fire at al-Aqsa Mosque in 1969 gave Saudi King Faisal the occasion to convene twenty-five Muslim heads of state and establish the Organization of the Islamic Conference, a United Nations for Muslims. Since the Islamic Revolution, Iran's one-rial coin and 1,000-rial banknote have featured the Dome of the Rock. Iranian soldiers at war with Saddam Hussein's forces in the 1980s received primitive maps marking a path through Iraq and on to Jerusalem. Ayatollah Khomeini decreed the last Friday of Ramadan as Jerusalem Day. Since Israeli occupation, some ideologues have sought to establish the historical basis of Islamic attachment to Jerusalem by raising three main arguments, all of them historically dubious. First, they assert a Muslim connection to Jerusalem that predates the Jewish one. Ghada Talhami, a scholar at Lake Forest College, asserts that "There are other holy cities in Islam, but Jerusalem holds a special place in the hearts and minds of Muslims because its fate has always been intertwined with theirs." Always? Jerusalem's founding antedated Islam by about two millennia, so how can that be? Ibrahim Hooper, national communications director for the Washington-based Council on American-Islamic Relations explains: "the Muslim attachment to Jerusalem does not begin with the prophet Muhammad, it begins with the prophets Abraham, David, Solomon and Jesus, who are also prophets in Islam." In other words, the central figures of Judaism and Christianity were really proto-Muslims. Second, and equally anachronistic, is the claim that the Koran mentions Jerusalem. Hooper (and others) argue that "the Koran refers to Jerusalem by its Islamic centerpiece, al-Aqsa Mosque." But this makes no sense: a mosque built a century after the Koran was delivered cannot establish what a Koranic verse originally meant. Third, some Muslims deny Jerusalem any importance to Jews. Abd al-Malik Dahamshe, an Arab member of Israel's parliament, flatly stated last month that "the Western Wall is not associated with the remains of the Jewish Temple." A fundamentalist Israel Arab leader went further and announced that "It's prohibited for Jews to pray at the Western Wall." Or, in the succinct wording of a recent Palestinian protest banner: "Jerusalem is Arab." Despite the loud assertions that Jerusalem is essential to Islam, the religion does contain a recessive but persistent strain of anti-Jerusalem sentiment. Perhaps the most prominent adherent of this view was Ibn Taymiya (1263-1328), one of Islam's strictest and most influential religious thinkers. (The Wahhabis of Arabia are his modern-day successors.) In an attempt to purify Islam of accretions and impieties, Ibn Taymiya dismissed the sacredness of Jerusalem as a notion deriving from Jews and Christians, and from the long-ago Umayyad rivalry with Mecca. More broadly, learned Muslims living in the years following the Crusades knew that the great publicity given to hadiths extolling Jerusalem's sanctity resulted from the Countercrusade--that is, from political exigency--and treated it warily. Recalling that God once had Muslims direct their prayers toward Jerusalem and then turned them instead toward Mecca, some early hadiths suggested that Muslims specifically pray facing away from Jerusalem, a rejection that still survives in vestigial form; he who prays in al-Aqsa Mosque not coincidentally shows his back to the Temple area toward which Jews pray. In Jerusalem, theological and historical arguments are in essence legal claims, crucial to who prevails. In this context, the fact that politics has so long fueled the Muslim attachment to Jerusalem has two implications. First, it points to the relative weakness of the Islamic connection to the city, one that arises as much from mundane need as from the immutable claims of faith. Second, it suggests that the Muslim interest lies not so much in controlling Jerusalem as it does in denying control over the city to anyone else. Jerusalem will never be more than a secondary city for Muslims. 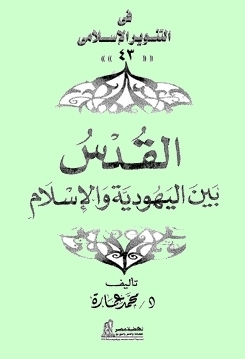 The cover of 'Imara's book. Mecca, by contrast, is the eternal city of Islam, the place where Muslims believe Abraham nearly sacrificed Isaac's brother Ishmael and toward which Muslims pray five times each day. Non-Muslims are strictly forbidden there, and the city's "very mention reverberates awe in Muslims' hearts," writes Abad Ahmad of the Islamic Society of Central Jersey. Very roughly speaking, what Jerusalem is to Jews, Mecca is to the Muslims. And just as Muslims rule an undivided Mecca, so Jews should rule an undivided Jerusalem. Nov. 1, 1999 update: This article has inspired a 47-page book in reply by an Egyptian scholar at Al-Azhar University: Jerusalem between Judaism and Islam (القدس بين اليهودية والإسلام) by Muhammad 'Imara, published in Egypt by دار نهضة مصر للطباعة والنشر والتوزيع. Sep. 1, 2001 update: For an enlarged and definitive version of this article, see "The Muslim Claim to Jerusalem."